As tech enthusiasts, we often get bogged down in the details: A particular product release, a certain feature, the size of a smart phone screen. 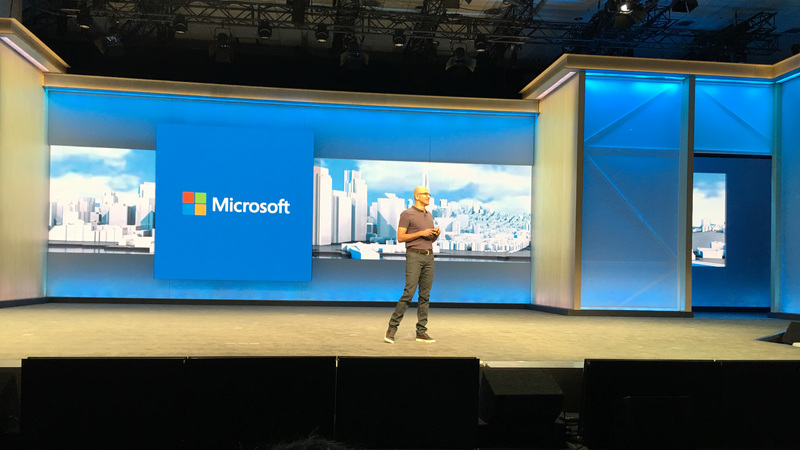 But at its Build 2016 opening keynote, Microsoft offered a broader vision for the future. Its future. And it’s customers’ futures. So, yes, there was a discussion about the next major update to Windows 10, called the Anniversary Update, and a peek at some of its new features. But the bulk of the two-hour-plus keynote was a whirlwind tour of cloud, bots, conversations, and personal digital assistants. And about how the power of these technologies is never tied to a single device. Instead, it is tied to the individual. For Microsoft watchers, this is of course the “mobility of experiences” that Satya Nadella has repeatedly discussed since he assumed his role as the software giant’s CEO. But today’s rolling list of announcements constitutes by far the biggest and most far-reaching of such initiatives. It is the mobility of experiences writ large. And it is exciting. And comprised of many parts, all of which point to that future of Microsoft I envisioned back in December, in Microsoft Owns Productivity And That Should Be Enough. In that editorial, I opined that Microsoft’s long-term future is basically Azure, and in providing services providing around and on top of Azure. And that by embracing this future, the firm could play to its long-time strengths at platform creation. To this end, Microsoft today announced additional features for its Cortana Intelligence Suite, which was previously called the Cortana Analytics Suite. Yes, it’s built on Azure, so it will work with whatever clients you choose to use. And yes, it uses “big data, machine learning, perception, analytics and intelligent bots”—more on that last bit in a moment—to deliver personlized, intelligence solutions. The first new Cortana Intelligence Suite feature is called the Microsoft Bot Framework. This enables developers to build “intelligent bots”—think “online services”—that customers can interact with, often via voice or text chat, via a variety of platforms, including text/SMS, Office 365, Skype, Slack, the web, and others. The second is Microsoft Cognitive Services. This is a collection of intelligence APIs that allows systems to see, hear, speak, understand and interpret user needs using natural methods of communication. Put together, the Microsoft Bot Framework and Microsoft Cognitive Services can transform the very concept of an “app” to mean something far more natural and interactive than is typically the case today. And the client? Seriously, it doesn’t matter. As an example of this future, Microsoft showed off a future version of Skype that utilizes the Skype Bot Platform, which of course builds of those new Cortana Intelligence Suite features. Skype bots will “come to life” in messaging starting today, Microsoft said, and will be added to audio and video calling in the future too. So what does that look like? Using new versions of the Skype client on Windows, Android, or iOS, an integrated Cortana makes connections with relevant bots as you type. So if you type “Marriott,” for example, Cortana will invoke the Marriott bot, which can then chat with you, all the way through booking a room at a particular hotel, right from within Skype. The bots use a nice card-based UI—shades of Material Design on Android—to present information to the user. It’s a lot to digest, but the key, I think, is that Microsoft is establishing itself as a credible cloud platform supplier whose wares can interact with whatever client systems—PC/Mac, mobile, web, whatever—users care to use. That’s not just the future, it’s future-proof. And it’s smart.